Discussion in 'Colored Gemstones' started by velouriaL, Jun 2, 2005. My new three stone spinel ring. It’s untreated red spinel from Tanzania, a lovely dark red with no orange, pink or brown to my eye. The stones are small but well cut with no windowing. Maisie, USCgal, mellowyellowgirl and 15 others like this. ...And since I’m here, I might as well post my aqua ring that I made a thread about recently. Both your rings are so gorgeous! The yellow daisy cushion makes me so happy to look at and I love that last shot of your aqua! GardenLady21 and Deathspi like this. I like it! Did you set it yourself? Are those spinels 4x3mm? They look close, to my eye. I've been eyeing some color change garnets that are 4x3mm from Yvonne Raley, and that ring setting looks perfect for that size. Can you let me know where you got the setting from? Ah, I didn’t set this one myself, it’s in white gold and I bought the ring from an Etsy seller. The stones are 5x4 so you are close! If you’re interested in setting your own stones, I would suggest starting with a larger round stone of at least 6mm. 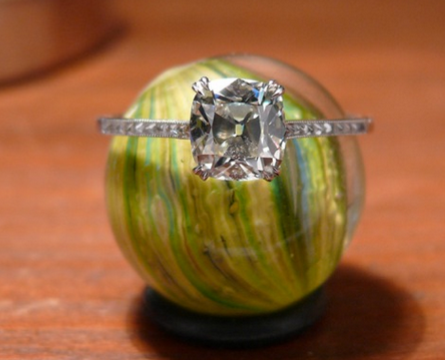 There is a learning curve as you have to hold the stone in place and it will be hard to do with a small one. As for vendors for silver settings, I recently posted in the thread in the Fashion Jewelry subforum , you can look there. Do remember you must ask for pre-notched prongs as we lack the skill or tools to notch them ourselves. I don't have really big, bling rings yet, like many of you do, but I recently got this untreated ruby from my then-boyfriend now-fiance. I am in love with the vivid red color. this is lovely, I really love how the cab glows against the diamond meelee. Combine with the size, such a standout “subtle beauty”! Thanks, Rubybrick, but it is not cabochon. It's a faceted native cut gem, 1.14 ct. I know there are some faceted cabochons, but this one is flat on top, just hard to capture the cut in photos. Here are a couple more pictures, in weak natural light and under camera flash. In the top one you can catch some facets. A cabochon would not have the dark colored areas under flash. The stone is more red in person and shows up more red on my camera than on my computer. Under sunlight, it really glows, but I live in the desert and don't fancy going out of doors to photo my ring. mellowyellowgirl, doberman, LisaRN and 3 others like this. lovely, really glowy! Sorry I didn’t see the facets in the first pictures! With my mom’s permission sharing a photo from the summer. This is my mom’s Zuni fetish necklace. When my sister was at Cornell veterinary college she bought this for my mom. I will ask my sister more about it today when I see her. All I know is it’s very pretty. Lol Just seeing the bracelet. I think it’s cloisonné. Not sure. Will ask my mom. Zoom in to see the necklace. Made up of all different natural stones. ETA just spoke with my mom and yes I’m right about the bracelet and my parents got it in St Thomas on their honeymoon in 1963. The 13 carat blue-green zircon I lusted after for five years and finally own! Life is too short to wear costume jewelry! J1981s, Drm1grl and GardenLady21 like this. Beauty is pain! But seriously though, I can't even imagine what the desert heat is like right now. It's "only" 97-99 degrees where I live; I stepped outside for a moment to take some pics in the shade and was like "F this" and went back inside the house. Rare gem lover and voce like this. I may have posted this before but here is my pink Tourmaline ring. It has crazy bright flashes of colour! TheGarnetGirl, Stone Hunter, KaeKae and 10 others like this. GardenLady21, princessandthepear, suzanne2 and 6 others like this. You got it set! It’s beautiful! The halo style really accentuates its elongated shape! Gorgeous!!! Were can we find your thread with lots of pics? My 3.26ct green tourmaline, here to join the other pretties residing in this thread. strawrose, Acinom, Burmesedaze and 6 others like this. I inherited this jade cocktail ring when I got married. I think it belonged to my mom’s godmother, who was a Buddhist nun, but I can’t remember for sure. strawrose, Acinom, Garnetgirl and 8 others like this. Garnetgirl, Bluegemz, mellowyellowgirl and 2 others like this. Recent aqua purchase. 7.87 carats by IVY New York. pregcurious, 2Neezers, LisaRN and 16 others like this. Love your new ring! Classic and beautiful. aac2013 and scarsmum like this. Was messing around with a few ring in the garden recently. I swear the neighbours think I’m weird! GeauxGirl, 2Neezers, AceofHearts and 10 others like this. Oh wow, your collection makes my heart flutter! I love that all your halos are different and well suited to the gem they frame. lovedogs and Deathspi like this. I received another ring from Aurosi Jewels on etsy. It's my 2.7 ct. tanzanite from Top Tanzanite. I'm very happy with it!!!! Deathspi, GeauxGirl, Mrs_Strizzle and 8 others like this. I love everything about this! Perfection! MrsKMB and LisaRN like this.